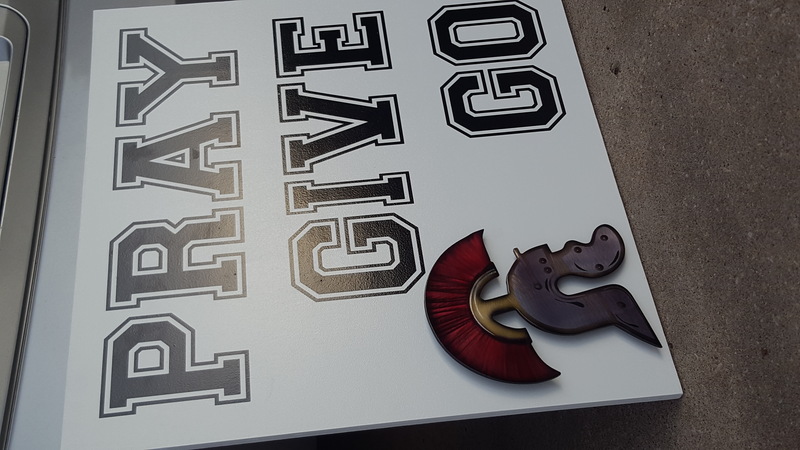 A good friend of mine at work told me about a sign that he once had at an old church and was wanting to replace it at his current church.This sign is ¾" sign board with black vinyl lettering.The helmet represents the Helmet of Salvation from Ephesians 6:17. 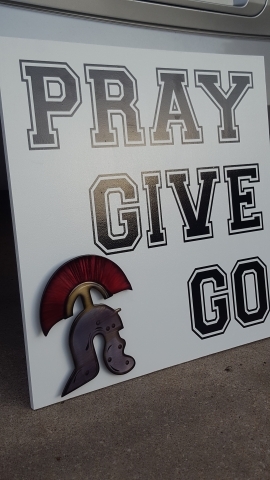 Its cut from 1/8" steel, airbrushed and clear coated.He was very happy with it and I hope that it will serve God and his church for a long time to come. "Ephesians 6:17 instructs us to put on the whole armor of God and to "take the helmet of salvation and the sword of the Spirit, which is the word of God." When a soldier suited up for battle, the helmet was the last piece of armor to go on. It was the final act of readiness in preparation for combat. A helmet was vital for survival, protecting the brain, the command station for the rest of the body. If the head was badly damaged, the rest of the armor would be of little use."